You are here: Home » Featured » Boston’s Restaurant Week, The Cure to the Winter Blues? Or is it the Cure for the Summer Blues? Please read the update for August 2010 Restaurant Week Options at the bottom of this year’s original Boston Restaurant Week post. March is here and spring is finally in sight. Boston’s Restaurant Week takes place this month and has been billed by some as the cure for the Winter Blues. I have to agree since this year the economy just has not been helping our wallets. Back in August we wrote about Boston’s Restaurant Week because it is a biannual event taking place in August and March of each year. Restaurants hope to entice the public back into their restaurants with deals that won’t put a big dent in your weekly budget. As is usually the case Boston’s Restaurant Week takes place across 2 weeks since the deals are not in effect during the higher traffic weekend days. The March’s dates are the 14th to the 19th and the 21st to the 26th. During those dates you can buy 2 course lunches for $15.10, 3 course lunches for $20.10 and 3 course dinners for $33.10 at participating restaurants. The meals are not necessarily off the normal menu so check out the menus or call beforehand if you have specific restaurants or meals in mind. Not all restaurants are participating in both dinner and lunch. No. 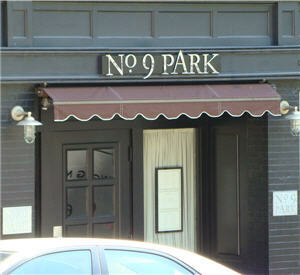 9 Park pictured above for example is only participating for dinner. The BostonUSA.com website that holds the information for the participating restaurants is pretty user friendly. There you can find lists of restaurants by name and neighborhood. For some restaurants you can make reservations and see their menus too. Interestingly enough this March’s Restaurant Week includes deals for more than just restaurants. Maybe as a symbol of the hard economic times they are also offering deals for half-price theatre tickets, concert tickets and special hotel rates. This is a great time to catch a show and a great meal at bargain prices. You should make sure to consider restaurants in you local neighborhoods. Even neighborhoods you don’t think of as being restaurant hubs have participating restaurants. This year Dorchester, East Boston, Charlestown and West Roxbury have restaurants offering these discounted meals. This is a great way of helping your local restaurants stay in business. Boston’s Restaurant Week is starting back up again for their August version of the meal deals that you can find in and around the Boston area. The pricing has not changed but the restaurants tend to change mostly with additions to the list. Date for August 2010 Restaurant Week are Sunday thru Friday August 15th to August 20th the next week from August 22nd to August 27th. Here are direct links to some of the neighborhoods you might be interested in. Keep in mind the BostonUSA.com site allows you to filter by town/neighborhood, cuisine and even whether the restaurants offer locally grown food.